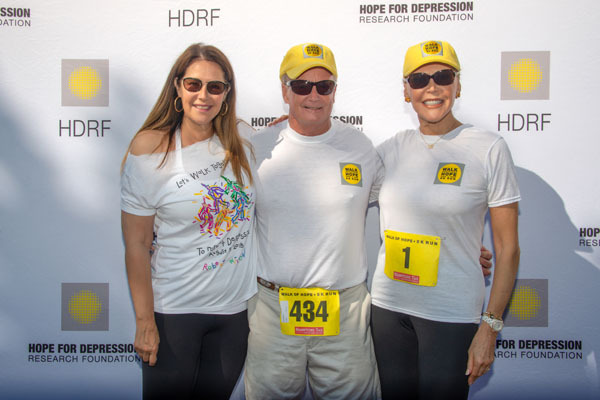 On a bright and beautiful summer morning, more than 500 men, women and children – plus a few canine friends – gathered at the starting line of Hope for Depression Research Foundation’s (HDRF) third annual Walk of Hope + 5K Run to Defeat Depression on Sunday, August 5th in Southampton. The high-energy crowd, which included CBS’s Blue Bloodsstar Lorraine Bracco, The Watermill Center’s Robert Wilson, and Jenny andJohn Paulson,set out at 9am to complete a tree-lined 5K course around Lake Agawam. The USA Track and Field-sanctioned event raised more than $250,000 for advanced depression research. Hope was in abundant supply as everybody sported caps in HDRF’s signature sunshine yellow, along with t-shirts with a custom design by Robert Wilson. The competitive runners – 89 in all – burst through the starting line, followed by families and fun runners. Following the race, Audrey Gruss and her team presented medals for best times in various age categories. 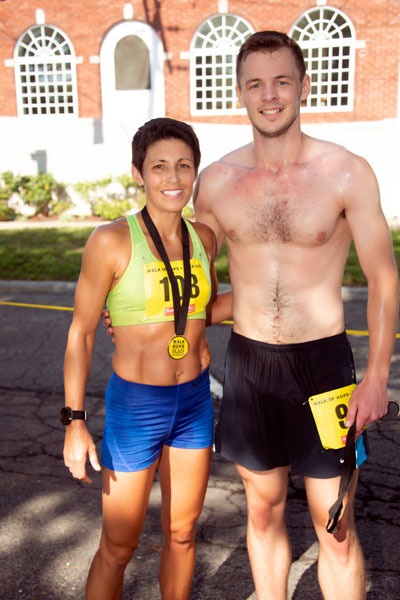 Travis Taylor won the best time in the Adult Male category, and Tara Farrell won best time in the Adult Female category. Mark Jacobello, age 13, won for best youth male, and Caroline Clagne, age 13, wonfor best youth female. Gruss then presented awards to the top individual fundraisers Scott Snyder and Kim Heirston, and an award for Top Fundraising Team to Arthur Dunnam and Roy Cohen, who named their team after their dog Oskar, who was in attendance. 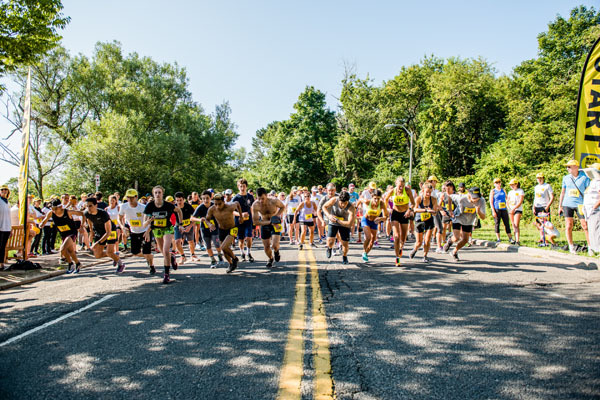 This year, the Walk of Hope + 5K Runwas heralded by the Week of Hope, a village-wide effort in Southampton to raise mental health awareness that started on July 26th, 2018. More than 90 stores in Southampton “turned yellow” by placing two-foot wide yellow statement balloons by their front door to symbolize hope and their commitment to changing the staggering statistics around depression. The initiative came in the wake of the suicides of Anthony Bourdain and Kate Spade, as well as local Sag Harbor resident and publicist Jeanine Pepler. Each shocking loss is a reminder that the suicide rate is rising in the U.S. and that depression is a national health epidemic. Every 12 minutes a person dies by suicide in the United States; depression is the leading cause. Additional participants included: Southampton Hospital’s Steve Bernstein, Somers Farkas, Jamee and Peter Gregory, Martin Gruss, Campion Platt and his children, Clelia and Tom Zacharias, Marigay McKee and Bill Ford, Erika Bloom, Samantha Gregory and Roberto Benabib with their daughter, Carolina Gregory-Benabib, Dr. Patrick Stubgen and Dana Hammond Stubgen, Janna Bullock, Jessica and Josh Gruss, Karen LeFrak, Caroline Bierbaum LeFrak and Jamie LeFrak and their children. The Walk of Hope was supported by its Committee members: Lisa Aery, Nona Murphy Collin, Arthur Dunnam, Christine Mack, Jay McInerney, Anne and Jacques Nordeman, and Alicia Owen. The Walk of Hope + 5K Run starts the lead-in to the 11thAnnual Luncheon Seminar which will be held on November 6th, 2018. The event will focus on “Brain Health and Wellness – the Science of Self Care,” and will honor public figures speaking out about depression and salute the research progress of HDRF’s acclaimed team of world-renowned neuroscientists. Audrey Gruss founded HDRF in April 2006 in memory of her mother Hope, who struggled with clinical depression. Today, HDRF is the leading nonprofit organization focused solely on depression research and public education. The World Health Organization has declared depression as the leading cause of disability worldwide, but despite its prevalence, depression is still misunderstood, underfunded and under-researched. The mission of the HDRF is to fund innovative neuroscience research into the origins, medical diagnosis, new treatments, and prevention of depression and its related mood disorders – bipolar disorder, postpartum depression, post-traumatic stress disorder, anxiety disorder and suicide. In the United States, depression affects over 20-million adults each year – that’s one in ten adults. Depression is the leading cause of suicide. In the United States, a person dies by suicide every 12 minutes – over 41,000 people per year. Depression is the number one cause of disability worldwide. The current annual cost to US society of treating depression alone is $210-billion – 60% of which represents reduced efficiency at work and costs related to suicide. Although depression is one of the most serious and prevalent conditions in the US, it is ranked 77th. (out of 250) in the amount of federal funding it receives. Most of the major pharmaceutical companies have discontinued brain research. Talented young brain scientists are being recruited overseas. There are very few privately-funded companies in depression research. The Depression Task Force represents the most innovative approach to neuroscience research today. The Task Force has created an unprecedented research plan with each member executing a piece of the plan in their own laboratories. They are not going down well-worn paths of research. They have identified major challenges in the field and are laser focused on the areas where the field is stuck. They share results in real time at a centralized data bank. This allows them to leverage data to accelerate research. This is unheard of in the entire scientific research field which is normally competitive and not collaborative.